The Hawkinsville Opera House has undergone many changes since its construction. Through prosperous and lean times; times of uncertainty and calm, and through various organizational utilizations, it has managed to maintain the grace and style of its initial design. The City of Hawkinsville is lucky indeed to lay claim to a true piece of southern architectural history, and has worked hard to restore the building to its former glory. ‘No sound will ever echo on itself and no one seated in the auditorium will have to crane their neck to see any part of the 75-foot stage’……Mr. Gunn never had to return his design fee. The auditorium, dubbed The City Auditorium, held the largest seating capacity of any public building in Pulaski County. During the first decades of operation, the Opera House was the host to many traveling and well known acts, and became the place to go for an evening out. The Opera House was available to the public and was used for many other things besides a true Opera House. For example, the facility became a place of worship when a local church burned, and later pinch-hit as a movie theater when that business succumbed to flames in the early 1950’s. In 1973, the Opera House was placed on the National Historic Register due to the forward thinking efforts of a group of local citizens. The Old Opera House underwent a 1.7 million dollar renovation in the year 2000,and proudly opened with state of the art facilities to accommodate today’s artists and performers. These features include new electrical, plumbing, and heating/air systems, as well as: theatrical lighting, sound, and rigging systems, an elevator, closed circuit TV in dressing rooms, new dressing rooms at stage level and below stage, presentation system with video production through DVD, VCR, or Power Point and meeting rooms complete with a warming kitchen. 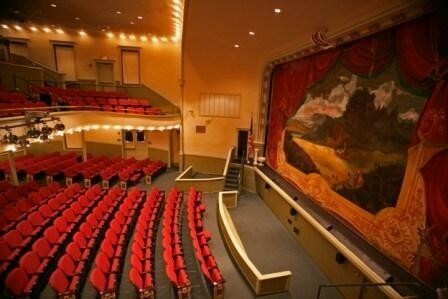 Today, the Old Hawkinsville Opera House is owned by the citizens of Hawkinsville and is operated and managed by non-profit Hawkinsville-Pulaski County Arts Council. We proudly foster talent of all genres and cultures of performances and entertainment, and care for a valuable piece of our history for all to share. Call the Hawkinsville Pulaski County Arts Council today at 478-783-1884 to arrange a tour for yourself, your church group, civic organization, or business and one of our volunteers will be glad to guide you on a walking tour through what is truly one of the great gems in the Middle Georgia area, the historic Old Opera House in Hawkinsville, Georgia.